I have several friends going through hard times right now. One trying desperately to regain her footing after divorce, one recovering from a bad fall and brain surgery (with a setback today), another fighting a debilitating virus for 8 months with no end in sight, one struggling through the process of seeing her sister-in-law go from home to hospice, and still another dear friend in the throes of dealing with a family member battling addiction. Tremendously hard times. My difficulties seem small in comparison. Yours may dwarf those, or possibly you are in a time of calm. The Lord is fighting for you! So be still! Download this Free Printable Scripture Verse HERE. This verse needs to be our banner. Our theme song, so to speak. We need to write it down, post it on our mirrors, on our computer screens, on the fridge, over the sink, anywhere we might see it and be reminded. Difficult days come out of nowhere and we need to be prepared for them. Despair can quickly sweep over us when we are in the midst of overwhelming difficulty. We want answers, we want solutions, we want our situations to change, we want resolution, we want normalcy, we want something other than what we are experiencing. The Lord is fighting for you! Right now… in the present… He is fighting for you. His angel armies have already gone ahead and God is your rear guard. Though you may not be able to see it… God is fighting for you. The next sentence in the verse is the kicker. It’s the one that flies in the face of culture. For me it’s so NOT who I am. You see I’m a doer… I spin wildly around working hard to make things right. I’ve been in the process of learning that God delights in working FOR us. Doesn’t that seem backwards and upside down? We seem to think that we work for God. To some degree that is true. The “work” that God desires from us is obedience. He is fully complete… he doesn’t need anything from us… let alone having us “work” for him. So if we’re not to “work”… what then? We need to let God fight for us. We need to quit playing God and let God be God. We need to trust HIM… no matter what. God delights in our leaning hard on him. He delights in our stillness. It’s in those moments of stillness we, for once, don’t get in his way with our own feeble agenda. It’s in those moments we see his greatness. His glory. His holiness. It’s in those moments people who need a glimpse of God’s love, grace, and mercy get more than a glimpse. It’s in those moments that we become strong. Unlike the athlete who gets physically stronger by working out, you and I get spiritually and mentally stronger by being still. It’s God’s upside down way of working for us, in us, and through us. Today, I am facing a mountain. I can attempt to claw my way up the mountain by sheer will in my own strength or I can be still. Standing at the base of the mountain I see obstacles and opposition ahead of me. 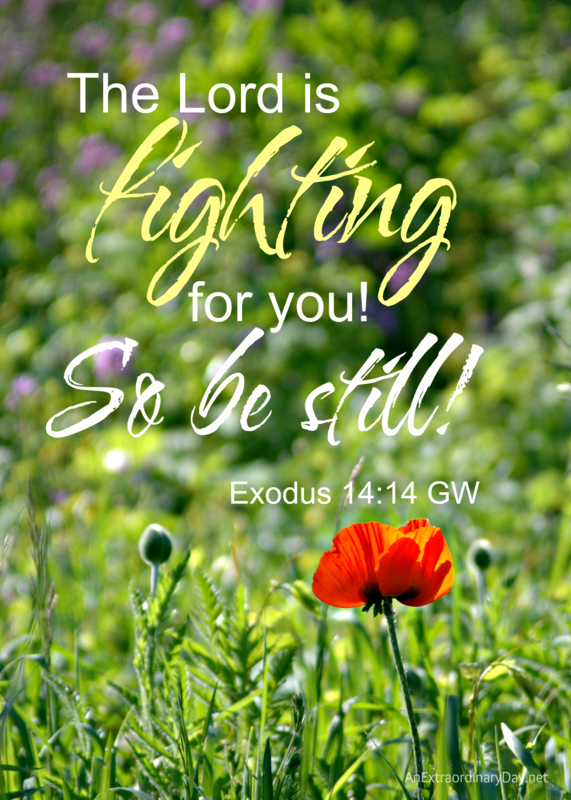 Remember… The Lord is fighting for ME! And… do the one thing I can do in the midst of hard times? Be still! I need to get out of the way and let God fight for me. I need to trust God. And not second guess him. I need to meditate on his word. I need to be ready and obedient to do whatever he asks of me. So where are you? What challenges are you facing? How are you going to handle those inevitable challenges? Are you going to be still and let God fight for you? I love JoyDay! There isn’t anything better than each of us sharing the good things God has done in our lives this week. Both in the happy and in the challenges. Thank you you for the beautiful words above, Diane. I won’t fight it anymore …silent I shall be. 1. A kind husband whose patience with me is awesome! 2. Stoneybrook Alzheimer’s facility, where my dear Mother resides, for being the best memory care facility in Texas. 3. Sarah, Dorothy’s palliative care physician, who relentlessly and lovingly cares for her. 4. My sweet puppies who sit by me when I cry. 5. Owen’s out of context remarks that make me smile. 6. Finally getting the house painted! So much better! 7. The picture I found of Dorothy!! She is so lovely. Isn’t that just like God to create that perfect timing, Debbie! You blessed me, today, too! I love everything you wrote . . . and needed the reminder. I’m sorry to read that your friends are having so many struggles, and feel grateful that they have YOU for a friend. Your wisdom and thoughtful words will help guide them through these hard times. Suzanne… your words are the warmest hug. Thank YOU! Hope your week is off to a beautiful beginning. I’m still too much of the time, I think. I have chronic fatigue and chronic pain from fibromyalgia, which makes it necessary for me to stay in bed longer than average. I received bad news from two quarters this week, and also had a long, emotional talk with my husband. I tend to mull things over repeatedly before action. Today, when I woke up and needed even more rest, I told myself, “Grab that book off the dresser, and READ. Don’t let your mind wander.” That was what I did to be still and let God fight the battles when there is nothing for me to do but pray. I know it is wrong to wallow in grief, when you truly believe God is on the throne. Thanks for this reminder, Diane. I guess I missed Joy Day and read this on Tuesday! Yes! Today I meditated on this verse and was still. Just still as more stuff piles to our plate. As I looked upon life’s circumstances I thought, wow Lord satan must see both Curt and I as a threat. Now another hurdle. In NLT three years ago I found this to be my ten finger fist verse: The Lord Himself will fight for you–just stay calm. Say each word. Put a finger down. It will by last word make a fist. It has been my reminder these last year’s. And as we got more difficult news for Curts health again we said that verse. But Diane, he wept at the sink. My heart hurts. For all he has endured yet praises God. And more he will have to go through. The Lord is so good. But there have been many strange tests these past weeks it makes us both wonder why satan is so afraid. All glory to God through Jesus Christ our Lord. He is our Redeemer. I like that word. Redeemer. Thank you again for your encouraging post. Oh Gwen… I am not in your shoes… but I absolutely know what you’re talking about. I have a very similar sense with things in our life. I love the ten-finger “object lesson.” We need object lessons in our day-to-day as much as kids do for understanding. Thanks for this one. Big Hugs to you and prayers… always. Empowering! I needed this today too. Thanks for sharing! All the best for a joy-filled weekend. Thank you for a great encouraging post. I think that we all try to do things by our own strength at times. Then God says calm down. Allow me to work. Exodus 14:14 is one of my favorite verses. It reminds me of the strength of the Lord in tough times that He is able to fight for me in all tough battles that I am facing. I’m right with you on Exodus 14:14. We’ve had some long battles, but letting go and watching to see what God does changes everything for me. There’s nothing like a renewed trust and a lighter burden. Thanks Brian for stopping by and taking time to share your thoughts. All the best for a week of joy!